Believe it or not, sapphires can be colorless. It is only the presence of trace elements which contaminate the crystal that give them their color. Of course, the sapphire we all know and love is the blue sapphire, but did you know that white sapphire can be a replacement for a diamond? In this article, we will explore which stone is better for you! A diamond surrounded by a halo of blue sapphires. Click here to view this ring. The actual physical difference comes in the types of mineral involved. Diamond is the hardest mineral we know and occurs in colors from white (colorless) through to black with several colors in between. Sapphires are made from the mineral corundum and are commonly blue due to the presence of titanium and iron in the crystal. Colorless sapphire, as you may expect, has no such contamination. 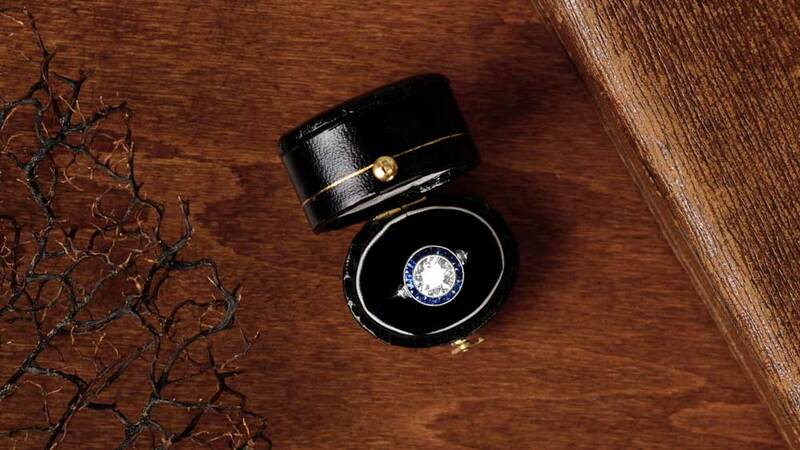 Although colorless sapphire is rarer than blue sapphires, it is still amongst the less expensive colors of sapphire. One reason is that, although used as a diamond substitute, it has a number of disadvantages. We refer to gemstones that have no color as white. It’s unclear why we do that, but it is likely to be so that it becomes another color in the range, rather than an altogether different classification. Even then, not all whites are created equal. White sapphires do tend to be colorless without any degree of tint. On the other hand, diamonds can contain quite a degree of yellow tint before we stop calling them white. The more yellow present, the less expensive the diamond usually is. But, even if we have both a colorless sapphire and diamond, the white is quite different. A good quality, colorless diamond has a sparkle and a fire that comes from how the light is reflected inside the stone before it travels back to our eyes. White sapphire, although colorless lacks some of that sparkle. The upside is that the color in a white sapphire is very consistent with no shading whatsoever. In a white diamond, with even the faintest hint of color, shading can occur when viewing the diamond from different angles. Is this enough to compensate, perhaps not but it is worth considering. As we’ve said, diamond is the hardest mineral known to man, rating 10 on the Mohs Hardness Scale. Sapphire actually comes next, with a rating of 9. The problem is that the one rating point extra that the diamond has is the equivalent of about 4x the hardness. In other words, sapphires are very durable, but not near as durable as diamonds. Both will be pretty resistant to scratching, which can dull the sparkle of the stones. Where sapphires begin to suffer is that even low levels of built up dirt and grease will dull the stone considerably. If left long enough, the appearance becomes very milky and stops resembling any kind of colorless gemstone. Of course, if you keep your white sapphire clean – and why wouldn’t you? – this shouldn’t be an issue. In real life, though, even those with the best intentions don’t clean their jewelry often enough. This is where a white sapphire has a massive edge over a diamond. A 1ct diamond of high color and clarity will cost anywhere between $7,000 – $10,000. A similar white sapphire will cost around $450. That may sound like choosing a sapphire is a no-brainer, but there’s a lot more you need to consider. A white diamond will be certified by GIA, UGL or another authorized grading body. This lets you see, at a glance, the exact quality of the diamond. The cut, clarity, color, and weight will all be clearly available for you to see. 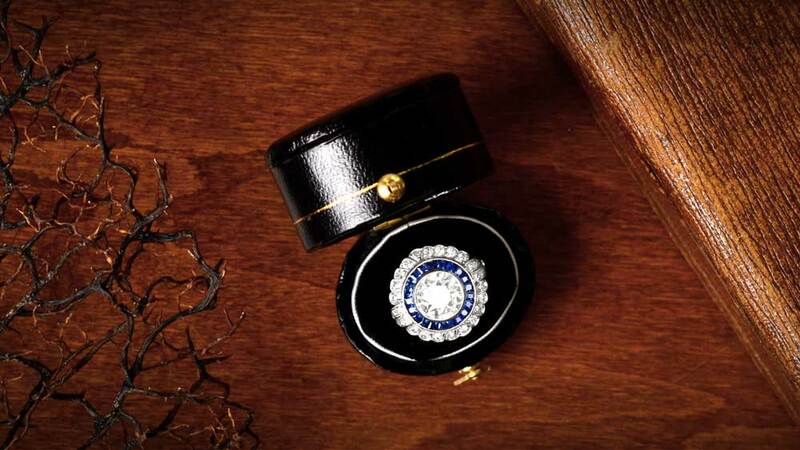 Sapphires are not subject to any kind of official grading system. This applies to all sapphires from the most spectacular blue sapphire to a colorless one. With more expensive colors, the quality of the cutting and polishing of sapphires is comparable to that for diamonds. With white sapphires, however, the much lower margins involved means there is a desire for dealers to get them to market as quickly as possible. If you are not an expert in grading gemstones, the quality can be difficult to determine. One would hope that any reputable dealer would be entirely honest about the stone in question but, without any kind of certificate, you can’t know for sure. If you are on a tight budget, of course, then white sapphire is one of a number of valid alternatives to the expense of a diamond. Even so, we advise caution about where you buy your sapphire. 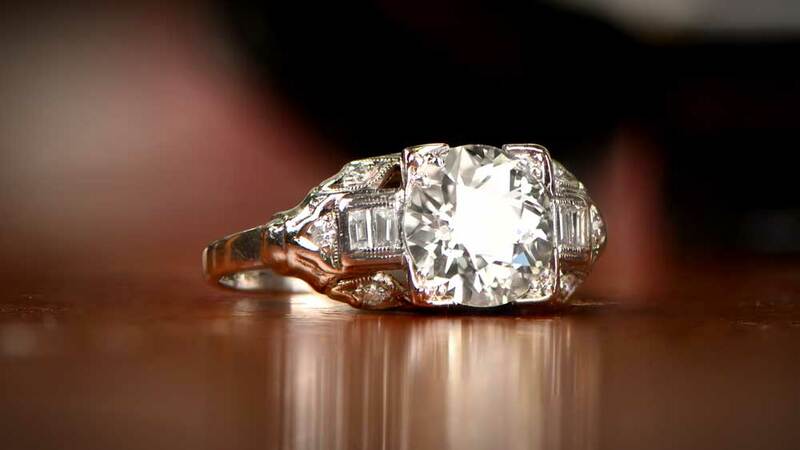 A rare vintage engagement ring featuring a real diamond in the center. Click here to learn more. 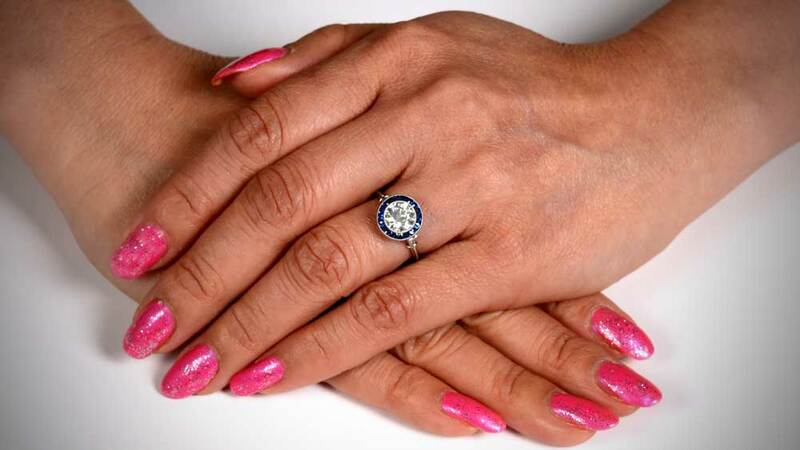 White sapphires are good for those who may struggle to finance a diamond engagement ring, but there are lots of potential pitfalls to buying one. They also need a lot more routine maintenance than a diamond ring, so be prepared to look after it. Diamonds bring a lot more sparkle and light to the party. Best of all, they do it effortlessly. Unless money is a serious issue, a diamond will always be the best choice for an engagement ring. It will last a lifetime and has the potential to look as good in 50 years as it does now. If you want a diamond alternative, and you aren’t interested in machine-made diamonds, a white sapphire is a great alternative!